Fine chocolate is full of complex flavors that are the result of many different factors. Both the environment and conditions in which the cocoa beans were grown, as well as the process that the chocolate maker employs play major roles in the flavor of the resulting chocolate. First, cleanse your palette. A small piece of bread, a little water or an apple slice will cleanse your palette, eliminating any pre-existing flavors that could mask or distort the flavors of the chocolate. Look at the chocolate. 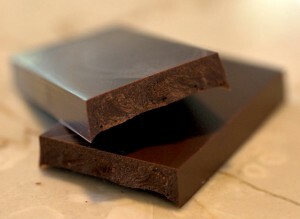 Chocolate should have a nice shine to it and the surface should be free of defects or white spots known as bloom. Next, break off a small piece. A good, crisp snap is a sign of good craftsmanship on the part of the chocolate maker. Smell the chocolate. Smell is a large part of taste, so smelling the chocolate prepares the mouth for tasting. Finally, taste the chocolate. Put the piece of chocolate on your tongue and let it slowly melt–don’t chew it. While it melts, pay attention to the texture: is it smooth, too smooth, a little gritty? Also, note how the flavor develops. Some chocolate is relatively simple, with one flavor throughout–while others will have distinct tastes at the beginning, middle and end. Is it fruity, bitter, earthy? Does it change as it melts? Does it linger after it’s gone?